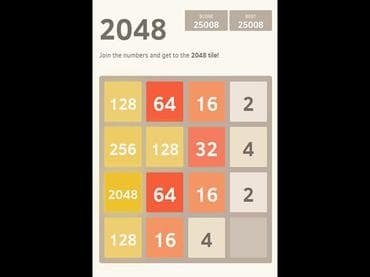 2048 is a popular web game created for fun over a weekend in March 2014. 2048 is a popular web game created for fun over a weekend in March 2014. The game was inspired by and based on the previously available games 1024! and Threes 2048 is so easy to play, you might get into the habit of tearing through games without even really paying attention to what you're doing. In order to win the game you should have a specific strategy. Take your time - there's no penalty for thinking your moves through after all. Download and play 2048 for free now! How to play: - Use your arrow keys to move the tiles. - When two tiles with the same number touch, they merge into one. Если у Вас есть вопросы, связанные с игрой 2048 пожалуйста используйте эту форму для связи с нами.